The Israelis have called off a planned air attack on a house in Jabaliya refugee camp in Gaza after hundreds of Palestinians formed a human shield. Mohammedweil Baroud said he was warned by Israeli forces to leave his home. He instead ran to a mosque and summoned neighbours to help defend the house. 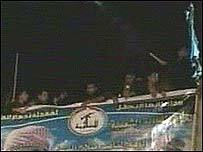 Mr Baroud is a commander in the Popular Resistance Committees militant group. The Israeli army often orders people out of homes ahead of attacks, saying it aims to avoid casualties. A Hamas commander at the scene said people had gathered to show that the demolition strategy of the Israelis could be defeated. An Israeli military spokesman confirmed to Reuters news agency that the raid had been called off because of the Palestinian action. "The attack plan was cancelled because of the people there," he said. "We differentiate between innocent people and terrorists." He said Israel would continue its policy of targeted air strikes and accused militants of using the civilians in the camp as human shields. Meanwhile one person was wounded in a rocket attack on the Israeli town of Sderot. Hamas said in a statement it had carried out the attack, the Associated Press news agency reported. 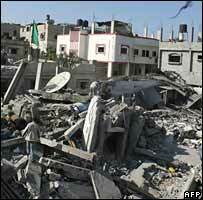 Israel often targets the homes of Gaza militants in response to such attacks. One woman was killed and several injured in an attack on Sderot last week. The BBC's Alan Johnston in Gaza says it appears that an unprecedented act of defiance by the Palestinians to a particular Israeli tactic has worked. The Israeli air force often uses night-time helicopter missile strikes to target homes in Gaza which the Israelis say have been used to store weapons or plan attacks on Israel. Very often the air force telephones a warning 10 minutes before the strike to give the occupants time to escape and keep down casualties, our correspondent says. But on this occasion, the presence of so many people has made it impossible for the Israelis to carry though their planned air strike. Hundreds of relatives and neighbours gathered at the house, where about 50 people reportedly climbed onto the roof. Others stood in the street chanting anti-Israeli and anti-American slogans. The Israeli military may have to factor in more such Palestinian protests in future when it targets the homes of suspected militants from the air, our correspondent adds. Following the protest, militant leaders urged Gazans to repeat the tactic in the face of future warnings by the Israeli air force. "We call upon all the fighters to reject evacuating their houses and we urge our people to rush into the threatened houses and make human shields," said a spokesman for the Popular Resistance Committees, quoted by Reuters. Two weeks ago, Palestinian women went to a mosque in the nearby town of Beit Hanoun in response to a request from Hamas commanders. Up to 15 Palestinian militants were hiding inside the mosque and a tense stand-off had developed between them and the Israeli forces surrounding the building. The Israeli army said the crowd of women acted as "human shields". The men were able to mingle with them and escape, despite two of the women being killed when Israeli troops opened fire on the group. Earlier on Saturday, two Palestinians were killed in clashes as the Israeli army seized two houses near Beit Lahiya, Palestinian residents and medics said. Palestinian militants went to confront them and at one point Hamas fighters struck with an anti-tank weapon wounding three soldiers.